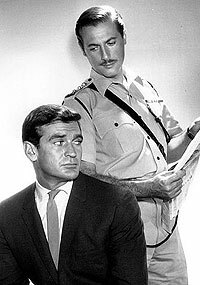 Rod Taylor played Glenn Evans, a "two-fisted American correspondent" based in Hong Kong and assigned to cover the Orient. Evans was equally adept at crime-solving, fisticuffs and romance. The suave newspaperman thwarted blackmailers, smugglers, kidnappers and murderers. But he also managed to spend plenty of time in a white dinner jacket, entertaining lovely ladies at the Golden Dragon nightclub. 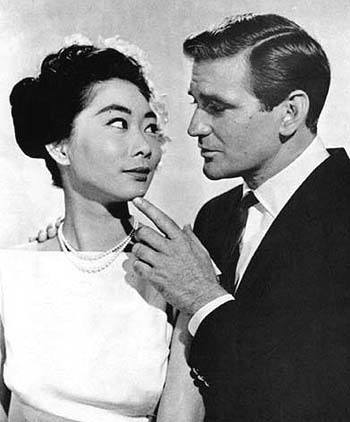 In fact, if you listen to Taylor himself, "The most wonderful thing about making the 'Hong Kong' series," he said in a 1961 interview, "was that they used a different leading lady every week." The show created a strong sense of place and adventure as Evans zipped about in his white convertible, with Hong Kong as a backdrop. Also helping set the mood was the show's extraordinary musical score, by Lionel Newman. The rest of the supporting cast included Lloyd Bochner as the very proper Chief Inspector Neil Campbell and Jack Kruschen as Tully, the owner of Tully's Bar. 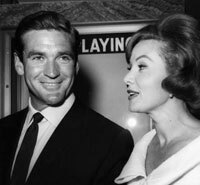 I felt the character of Glenn Evans could very well be Rod Taylor. I'm not creating a separate screen personality for this. If I got up there on the screen and "pretended" for 39 weeks, somebody would see through it or else get awfully sick of it. Either the public buys me, or we're out of luck. Now, don't confuse "screen personality" with "character." This character of Glenn Evans, for instance, the roving American correspondent, is a guy who can be charming in a Cary Grant situation and be just as suave -- then take off his coat and slug it out, as Cary Grant wouldn't. He can be a gentleman and still be tough. Nevertheless, it was a growing experience for the young lead actor. In addition to getting his name and face more well known, Taylor said, "I learned so much professionally. Learned to work in different areas, to relax where I'd been tense. And I learned to put more of myself in the part, to channel more of Rod Taylor and less of Glenn Evans into the show." The studio did try to start "Hong Kong" up again under a new title. During February 1962, Rod shot the pilot film for "Dateline: San Francisco," relocating Glenn Evans to the city by the bay. However, in a 1965 fan newsletter, Rod reported that the pilot was finished too late to get a good network time, so it was shelved by the studio. 0.1 -- Unaired 30-minute pilot -- "Blind Justice"
The 30-minute unaired pilot is the short version of the "Blind Bargain" episode. Instead of Lloyd Bochner as Inspector Neil Campbell, Alex Davion played Inspector Geoffrey Scott. 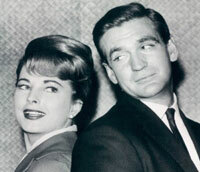 1.1 -- Sept. 28, 1960 -- "Clear for Action"
The first episode, of course, sets the scene and introduces the regulars. 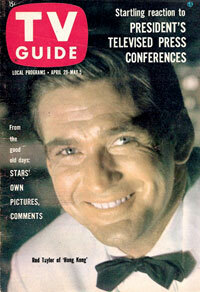 Rod Taylor gets to be debonair and daring. This one also features a corny plot device featuring a naive Navy man, a runaway pig and a lovely lady named Happy (France Nuyen). Directed by Ida Lupino. Taylor experienced some real-life drama when trying to shoot a scene at the border between Hong Kong and communist China: "We set up the camera as if we were going to shoot the Hong Kong side," he told a magazine in 1961. "And then I walked across a little narrow railroad bridge, gave a signal behind my back, and the camera swung around to shoot the border. ... When I walked up to the border, this [Red China police] guy has his machine gun trained on me." 1.2 -- Oct. 5, 1960 -- "Murder Royal"
Glenn gets involved in a plot to assassinate the visiting king of an Asian country. In the end they kill the king but get his son to safety. 1.3 -- Oct. 12, 1960 -- "Pearl Flower"
Glenn helps an American visitor (guest star Inger Stevens) locate a little girl she's been sending care packages to. But the charity turns out to be a front for a spy operation. 1.4 -- Oct . 19, 1960 -- "Freebooter"
1.5 -- Oct. 26, 1960 -- "The Jade Empress"
1.6 -- Nov. 2, 1960 -- "The Jumping Dragon"
This is a dark episode filled with murder, smuggling, and people being thrown out of airplanes. Glenn woos a Swedish stewardess, but danger gets in the way. 1.7 -- Nov. 9, 1960 -- "Blind Bargain"
1.8 -- Nov. 16, 1960 -- "Colonel Cat"
1.9 -- Nov. 23, 1960 -- "The Turncoat"
1.10 -- Nov. 30, 1960 -- "To Catch a Star"
A flight carrying a movie crew overcomes a perilous landing, but Glenn is skeptical that it wasn't a publicity stunt. He charms his way into a date with the leading lady (Luciana Paluzzi, who would also be Rod's co-star in "Chuka" and "Powderkeg.") Then she's kidnapped. Glenn suspects another publicity stunt. It starts out that way, but turns serious -- and deadly. A swarm of shoe-shine boys help Glenn save the day. Also guest-stars Edward Andrews. 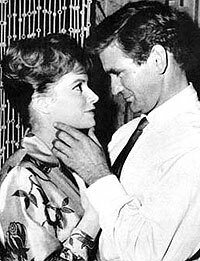 1.11 -- Dec. 7, 1960 -- "Nine Lives"
This top-notch episode exudes atmosphere, starting with Glenn's shipboard encounter with a slick gambler and his "niece" (Patricia Barry) as well as a survivor of a prison camp who's out to expose a traitor in Hong Kong. The traitor has established himself as a respectable publisher, and is a friend of Glenn's, setting up tests of loyalty and character for both men. 1.12 -- Dec. 14, 1960 -- "The Dragon Cup"
1.13 -- Dec. 21, 1960 -- "When Strangers Meet"
A diplomat, Andrew Manton (Kenneth MacKenna), arrives in Hong Kong where he meets a private detective. Manton's son was killed in an accident and Evans believes that he's having the incident investigated. In addition to pursuing the story, Glenn also flirts persistently with Manton's secretary, Peggy Jackson (Pippa Scott). 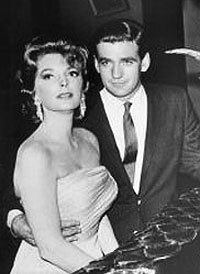 1.14 -- Jan. 4, 1961 -- "Suitable for Framing"
Glenn is courting a lovely singer (guest star Julie London), but romance is interrupted as he gets framed for murder in retaliation for a damaging article about a smuggling scheme. After being slipped a mickey, Glenn wakes up to find a dead man in his apartment. He goes into hiding, and with the help of the lovely singer, sets out to clear himself. 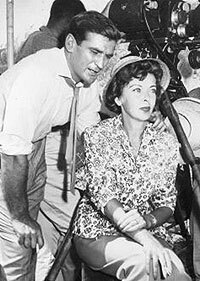 1.15 -- Jan. 11, 1961 -- "Lesson in Fear"
Guests stars included David Hedison and Suzanne Pleshette. Evans goes on holiday to Honolulu. Of course it's not a real holiday -- he's after a story concerning jewel smugglers. But he gets more than he hoped for when a sailor turns up. He romances a femme fatale again in this one. 1.16 -- Jan. 18, 1961 -- "The Survivor"
1.17 -- Jan. 25, 1961 -- "Night Cry"
Where's Rod? The story line involves a bad cop who kills a guy and frames an old friend of the police chief. Meanwhile, Glenn is off in Tokyo, appearing briefly at the beginning and end of the show. 1.18 -- Feb. 1, 1961 -- "Double Jeopardy"
The show opens with a beautiful woman (guest star Felicia Farr) poisoning her partner in crime. After stashing away a large sum of money, she shows up at Glenn's door and invites herself in for the night. Glenn, of course, is accommodating. While he's working the next day, she is killed in his apartment. Soon afterward, Glenn encounters the woman's twin sister (also Felicia Farr). A romance begins, and Glenn solves the mystery behind the murders. Or does he? The money is still missing -- and which twin really committed the crime? 1.19 -- Feb. 8, 1961 -- "Lady Godiva"
Dina Merrill guest stars as Mrs. Helen Rowan Randolph. From the first mention of her arrival in Hong Kong (the news is received by a shirtless and hung-over Glenn Evans) we know she and Glenn have history. They were correspondents together in Korea, about 10 years previously. Then she went back home and married the publishing magnate for whom they worked. He subsequently died and left her the empire. Glenn calls her "the 20th century's answer to Lady Godiva," referring to her crusading nature. What he won't call her is boss. "I just file a weekly story for her late husband's magazine," Glenn insists. Helen is visiting Hong Kong to investigate the murder of one of her journalists, Howard Conrad. Gunfire, poisoning, double-crossing, snappy repartee, regrets and romance combine for an entertaining episode. 1.20 -- Feb. 15, 1961 -- "The Hunted"
A U.S. doctor is accused of assassinating a foreign minister in an unspecified (presumably communist) country. Evans gets involved trying to prove his innocence. 1.21 -- Feb. 22, 1961 -- "With Deadly Sorrow"
1.22 -- March 1, 1961 -- "Murder by Proxy"
1.23 -- March 8, 1961 -- "The Woman in Gray"
1.24 -- March 15, 1961 -- "Love, Honor and Perish"
1.25 -- March 22, 1961 -- "The Innocent Exile"
1.26 -- March 29, 1961 -- "The Runaway"
Dateline: San Francisco: Glenn Evans' next assignment. Classic TV Archive: Episode guide and other information on "Hong Kong." 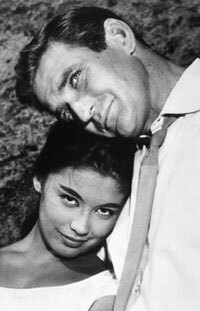 TVparty.com features "Hong Kong" among its Action Shows of the Sixties section. "Hong Kong" was loosely based on "Soldier of Fortune," a 1955 movie from 20th Century Fox. UCLA's Film and Television Archive: If you're in the neighborhood, UCLA has all of the episodes of "Hong Kong" available for viewing.